“Raise your shield.” That’s the message the Federal Government sent to American businesses last week as part of a new cybersecurity awareness campaign. But according to a recent survey of security professionals by Syncsort, the majority of enterprises, including IBM i shops, are confident in the security protections that are already in place. The big question: Have they actually done enough? The National Counterintelligence and Security Center (NCSC) kicked off a new security awareness campaign last week called “Know the Risk, Raise Your Shield.” The NCSC says that foreign intelligence entities are actively targeting information, assets, and technologies” that are vital to U.S. national security and competitiveness. “Increasingly, U.S. companies are in the crosshairs of these foreign intelligence entities, which are breaching private computer networks, pilfering American business secrets and innovation, and carrying out other illicit activities,” the NCSC says. While it’s true that major cybersecurity incidents do continue to happen on a regular basis, the data do not indicate there’s been any kind of spike in activity. According to a search of Privacy Rights Clearinghouse, there was a total of 807 breaches of all types made public last year, involving 1.3 billion records. That figure was down slightly from 2017, when PRC recorded 862 breaches impacting 2.0 billion records, and 2016, which had 826 public breaches that impacted 4.8 billion records. 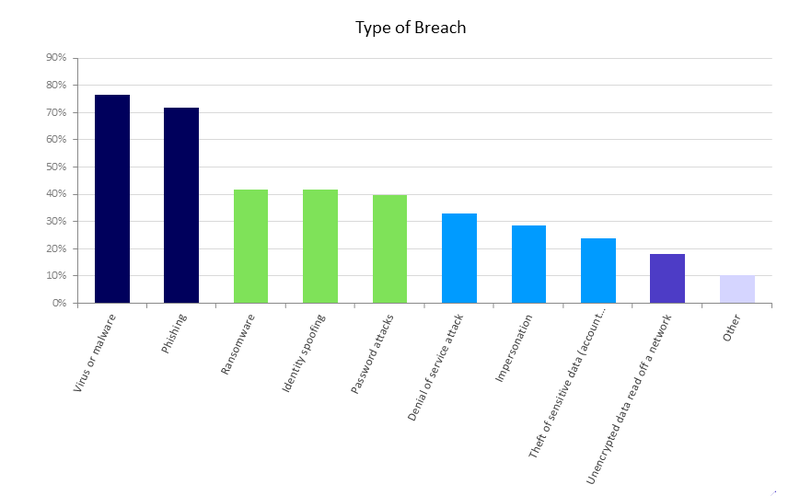 2015 saw 547 breaches impacting 318.8 billion records, according to the database, while 2014 saw 869 breaches with 1.3 billion records, nearly identical to 2018. The “Raise Your Shields” campaign may help raise awareness of security vulnerabilities, but they have been happening for some time, says Terry Plath, a senior vice president of support and services with Syncsort (formerly Vision Solutions). 85 percent of respondents said they were “very confident” or “somewhat confident” in their organization’s security program. 3 percent said they were “somewhat unsure” or “very unsure” about their security program. 74 percent said their organization conducts audits annually or more frequently. 41 percent said their organization has experienced a security breach. 39 percent said their organization has not experienced a security breach. Plath said the fact that 85 percent of respondents displayed confidence in their security postures, and yet 41 percent say they have experienced some type of security breach, represents a disconnect between how organizations view their own security posture and the reality of the situation. Organizations suffer a range of security breaches, according to Syncsort’s Security 2018 survey. On the surface, the fact that three out of four organizations conduct audits at least yearly should provide some reassurance that organizations are looking for signs of hackers, malware, and disgruntled employees. However, that could provide a false sense of security because many problems don’t show up in audits, Plath says. For example, despite the fact that IBM i shops are being audited as often as organizations that rely on other platforms, there are longstanding security problems related to how the systems are configured, Plath says. Security continues to be the top priority for organizations in 2019, according to Syncsort’s Security 2018 survey. The survey also found that 25 percent of IBM i breaches involve theft of sensitive data. Plath says that figure is likely higher than in the general population because of the business critical nature of the applications running on IBM i.
Syncsort also asked organizations how long it took them to discover security breaches. Nearly 40 percent had no breaches, but about 21 percent of the full sample said it took them less than a day, 12 percent said it took them a week or less, and about 4 percent reported a month or less. However, around 8 percent said it took them longer than 31 days to find the leads, and it took some over a year to discover the breach. Judging from the sample size, it’s quite possible there are companies in Syncsort’s sample that have breaches that haven’t been discovered yet. In previous years, Vision Solutions has released a State of Resilience report around the first of the year that focused predominantly on high availability and disaster recovery issues. That survey effort has morphed into security, where Syncsort is making significant investments. Last year’s State of Resilience survey pegged security as the number one priority of IT professionals, followed by HA/DR, cloud computing, and upgrading applications, in that order. This year’s survey also finds that security is the number one priority, followed by cloud computing, application upgrades, and HA/DR. Syncsort/Vision Solutions has made three IBM i security acquisitions in the past 18 months. That includes Enforcive (formerly BSafe), Cilasoft, and Townsend Security‘s AES/400 encryption software. T.L. Ashford writes software to generate Barcode Labels and Forms for the IBM i.
TLAForms converts traditional IBM i spool files into high quality, professional forms that are output as PDF documents. A form is associated with a spool file and the form is designed. TLAForms then ‘watches’ the IBM i output queue for a new spool file to be generated. When a new spool file is generated, TLAForms reads the data from the spool file, places the data on the form, and outputs a PDF document. The PDF documents can be archived to the IFS, automatically printed, and emailed. Barcode400 is native IBM i software giving you the ability to design and print labels directly from your IBM i in minutes! Compliance and RFID labeling is just as easy using Barcode400’s tools and templates. Generate Labels as PDF documents! Print labels interactively – No Programming Necessary! IBM Boosts Prices On Lab Services Engagements Guru Classic: Call Again And Again And Again . . .